A pioneering technique to convert waste aluminium foil into a key biofuel production ingredient has been developed at Queen's University in Belfast. The breakthrough could also reduce the vast amounts of aluminium foil that goes to landfill every year. Around 20,000 tonnes of aluminium foil packaging is wasted in the UK alone each year - enough to stretch to the moon and back. Most goes to landfill or is incinerated as it is usually contaminated by grease and oils, which can damage recycling equipment. 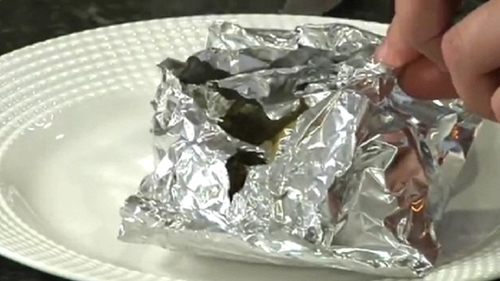 Researcher Ahmed Osman has developed a method to transform dirty household foil, discarded after cooking. His pioneering technique involves a crystallisation method to obtain pure aluminium salt crystals from used foil - the crystals can be used in the production of alumina biofuel catalyst. That type of alumina usually comes from bauxite ore, which is mined in places such as West Africa, the West Indies and Australia, with major environmental consequences. Mr Osman took on the project under the university's Sustainable Energy, Pioneering Research Programme. He believes he has created a solution that is more environmentally-friendly, effective and cheaper than the commercial catalyst. His research has been published in Nature Scientific Reports. "I have always been inspired by chemistry and I believe that catalysis especially can make the world a better place," said Mr Ahmed. "One day I took a walk through our laboratories at Queen's and found lots of aluminium foil waste so I did a little digging and after speaking to my colleagues, I ran my experiment and was astonished by the ultrapure single crystals - I didn't expect it to be 100% pure. "At Queen's, our scientists and engineers often work hand in hand on common challenging problems for the society. "By using our joint expertise, we have been able to tackle the issue of sustainable development and come up with a research solution which lies in an area between chemistry and chemical engineering. "This breakthrough is significant as not only is the alumina more pure than its commercial counterpart, it could also reduce the amount of aluminium foil going to landfill while also sidestepping the environmental damage associated with mining bauxite."